In the last installment, I discussed the various aspects of the waste management and reduction program at UConn, in response to frequently asked questions. For this blog, I will walk you, the user, through the program, and tell you how to find the various resources you need for using it. Guidelines for what items can, and cannot be recycled, are available online here. It is a common misconception that “single stream recycling” means that regular garbage and recyclables get mixed together. Single stream actually means that all recyclable materials are collected together, and separated at the plant upon arrival. If we use a single stream program, why do I still see dual-stream bins for recycling collection? We get this question a lot. The answer is quite simple: economics. There is nothing wrong with the old bins. Dual stream bins have openings shaped to permit cans and bottles, or paper, etc. to be placed inside. The reason we do not replace them is that it would cost tens of thousands of dollars to replace either the bins or lids. The old bins are still collected as recycling and processed as such. You can always lift the lid to add new items that do not fit the standard openings. To use the bins, check the guidelines. Wipe out or rinse the items if they are heavily soiled with greasy or thick food residue, such as plastic food containers that have salad dressing in them. Light soiling is acceptable, but heavy soil interferes with the recycling process. Be conscious, and make it a point to check your items every time you throw something away. In many cases, all or part of most items is recyclable. 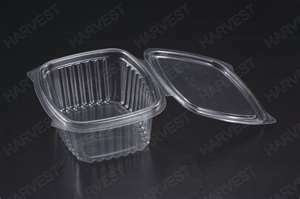 For example, the plastic boxes that some biological equipment comes in are recyclable, even if the tips themselves must be disposed of as hazardous waste. Most hot beverage cups however are not. It only takes a few moments to educate yourself. For hard copies of the single stream guidelines for your area, in English or Spanish, please contact the OEP Sustainability Coordinator at x5773. 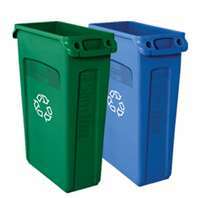 If you think an area could use more recycling bins, or a larger bin, please contact Dave Lotreck in Facilities to arrange a delivery. E-Waste is defined as material having electronic components, such as computer boards, digital displays, or microchips. This definition includes digital cameras, television sets, handheld devices, cell phones, etc. ; and also includes printers, ink cartridges, and batteries. It should be assumed that none of these items should be disposed of in a regular waste stream. Your first consideration with small items should be the E-Waste recycling program, which has collection centers in the library, Student Union, and Co-Op. The program accepts cell phones, cameras, laptops, ipods, PDA’s, and ink cartridges; and the small refunds provided by the company (a few cents per item) are used to support the Campus Sustainability Fund. 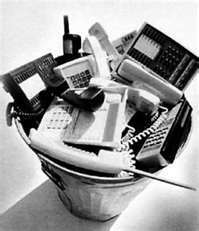 Look for comprehensive guidelines to e-Waste to be posted soon to the OEP web site. Batteries and other items deemed as hazardous must be handled by the Environmental Health and Safety Department. Please see their guide on proper battery disposal, by type. You may contact them here to arrange for a pickup of hazardous items. It is also a good idea to check if your department has any regular collection bins or programs for these items. Used car batteries are accepted by the Motor Pool. The University of Connecticut provides several incentives for waste reduction at the point of purchase. The UConn Co-Op offers their wooden nickel program, which donates to one of 4 charities/ groups of your choice each time you choose to not accept a new plastic bag with your purchase. 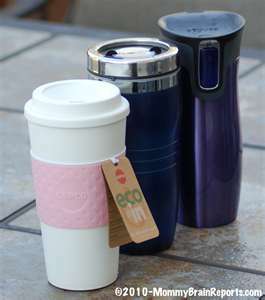 Our cafes offer a $.15 reduction on each hot beverage purchase made with a reusable cup. The Food Court has a re-usable food container program that lets you purchase your food in a re-usable container, then return the container directly to them for cleaning and re-use. Your program participation, after the first purchase, is verified via a card similar to the store cards you may already have. 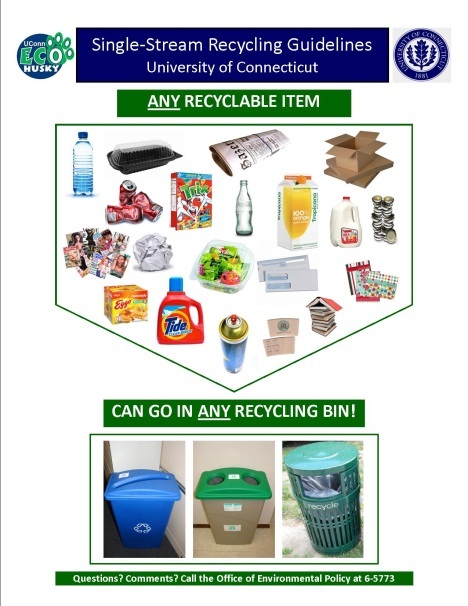 For items, such as napkins and hot beverage cups, that cannot be recycled, the University has a post-consumer recycled content policy. Most of these items are created using the maximum amount of post-consumer recycled paper content allowed by law. The Give and Go Program is the University’s largest donation program, but keep in mind that several other campus and local groups can use donated items either as re-use or for resale. Watch for fund-raisers for old clothes, and know that there are community donation bins in many regional areas. One of the closest is a book, clothing, and electronics donation/ recycle box on Rte. 44 just past the intersection with Rte. 32. Savers in Manchester is a great community store that accepts donations, and the Salvation Army has many regional locations. Community Outreach maintains a list of organizations always in need of donated clothes, household goods, and electronics. All of these organizations offer tax deductions for the value of donated items. Items such as compact and overhead fluorescent light bulbs, rags soaked with solvents, aerosol cans, and antifreeze cannot be placed into the regular waste stream. The University Environmental Health and Safety Department maintains a comprehensive guide for proper disposal of these items, which may be found here. In my position as sustainability coordinator, I receive a lot of questions regarding what I would refer to as our waste reduction and management program at UConn. A program, in this sense, is anything that your University does that touches the concept of waste management and reduction, including procurement of supplies, disposal of hazardous waste, placement of recycling bins, use of composting, etc. I recently compiled information for the 2012 Sierra Club Cool Schools survey, where I had to detail the tonnages of waste from various sources, and trace what happens to that waste. The process prompted me to write a blog series on waste management at UConn, in order to help interested personnel understand how waste management happens at the University, and what kinds of volumes we deal with (where applicable). The next section will deal with how students, staff, and faculty can navigate our various recycling channels most effectively. The third section will cover the vision for the future, and ways that you can get involved. Waste from each area should then be considered by type; resulting in classes within each area such as hazardous waste, bio-hazardous waste, organic waste, bulky waste, reusable items, recyclable waste, compostable non-organic waste, electronic waste (“e-waste”), and non-compostable inorganic waste. Even within categories, there may be more than one classification. 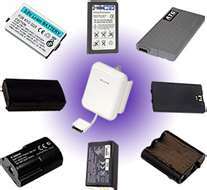 For example, cell phone batteries are a type of e-waste that are classified as hazardous, and must be handled as such when not encased in cell phones. Some organic wastes can be composted, and some cannot be. 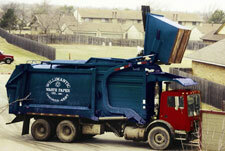 Proper waste classification is the key to any recycling or reuse program. clippings, tree branches, discarded plants, etc. ), and a significant portion of manure waste. The 2011 amounts reported were 800 tons of manure waste composted (50% of the total generated), and 21.25 tons of landscaping waste. The 800 and so odd tons of waste not composted were used as fertilizer for the farm fields. Due to varying nitrogen levels, not all manure waste is suitable for our composting facility. Construction and repair projects generate a lot of waste that does not get included in our regular waste stream. The work on projects is performed by independent consultants, who sub-contract for waste removal and recycling. While exact rates are unknown, a review of practices shows that contractors are recycling as much as 95% of all waste generated on any given project, due partly to regulations for LEED contracting, and partly due to high landfill costs. Dining Services runs a food donation program at the end of the year, and the Office of Community Outreach coordinates a huge moving out program that collects items for donation and reuse by local charities and non-profits. Called “Give and Go,” this program collects over 12,000 lbs of items each year. The Office of Environmental Policy also collaborates with Willi-Waste and the Nike “Re-Use a Shoe Program” for its annual sneaker recycling drive, which in 2012 collected almost 4000 lbs of used sneakers for reuse and recycling. UConn Storrs campus runs its recycling program through Willi-Waste, which recently went to Single Stream recycling. This means that all recyclable materials can be mixed together in the same receptacle, because they are later sorted mechanically and manually at the processing plant. NOTE: Single stream does not mean that garbage is mixed with recycling, simply that plastics can be mixed with glass, cardboard, and paper. Last year, we recycled 888.76 tons of material through the mainstream program. Central Stores collects all larger items (computers, televisions, etc.) and recycles 100% of the ones that cannot be refurbished as part of their program, recycling over 60,000 lbs of material total some years. All items from academic and residential areas not covered by one of the above programs is handled via our regular waste stream. 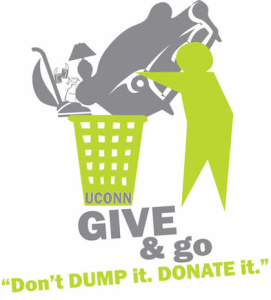 In 2011, the UConn campus generated 4253 tons of materials via the regular waste channels. This material is incinerated in closed systems for electricity generation, creating a byproduct of ash that must be stored in landfills. In the next two segments, I will be writing about how we are working to reduce this amount, and how you can get involved in the process.